Design your garden using the ancient art of feng shui for a tranquil place in nature that is inviting, relaxing, and energizing. The use of the feng shui elements, the arrangement of color, and the placement of each object or plant has an important role in the balance and harmony you want to create. Curvy areas and pathways, raised flowerbeds, and various levels of rock all help the chi energy to flow through your garden. With chi flowing freely, your garden will be in tune with nature and provide you with the beneficial effects of positive chi energy. Feng shui gardens need to have the three feng shui key of mountains, greenery, and water featured. Rocks and raised flowerbeds can symbolically represent mountains, while plants, shrubbery, or trees provide the necessary greenery. A water feature can provide the water element such as a fountain, pond, or birdbath. You may prefer to create a symbolic river of stones and rocks to represent water. The five elements of feng shui are represented in your garden by various plants and objects. The following are some of the ways to bring the elements into your garden. 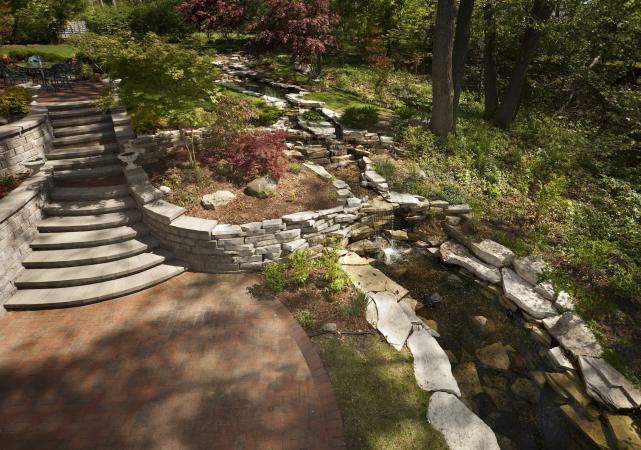 Feng shui gardens must be free of clutter so the chi has an unobstructed path throughout. A garden should have order, with everything having a specific purpose and place. Each tree, plant and object is there to balance the five feng shui elements. Remove fallen tree branches, dried leaves or decaying plants right away as their presence disrupts the flow of chi and lowers the energy level of the area. The following are links to examples of beautiful, tranquil feng shui garden designs. Feng shui practitioner, Carol Hyder guides you through a traditional feng shui garden in this brief video. Explore some Google images of feng shui gardens for more inspiration. Applying the principles of feng shui to your garden landscape design will give you a feeling of calm and well-being as you enjoy your special outside place. Don't forget to add doorways or passageways throughout your garden design along the pathways as you move from one area to another. A moongate, a rounded passageway is a classical feng shui garden design element. Other passages can be created with various structures or simple arbors or archways created by trees or shrubberies.